It's the first week of January and I'm already breaking my posting routine by blogging on Wednesday and not Tuesday. 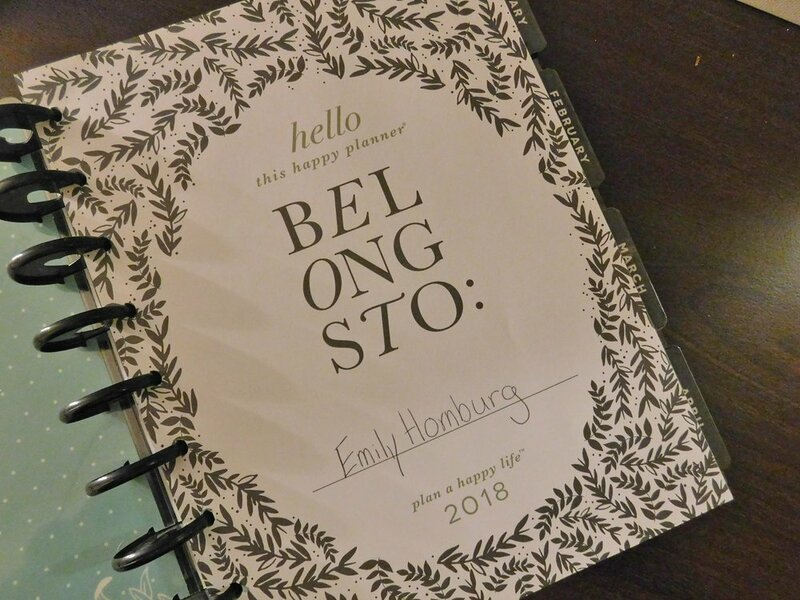 But, when I saw that one of my favorite bloggers, Helene in Between, was hosting a year in review and 2018 goals for January 3 link up, I had to join in on the fun. I was already planning a blog post on this topic anyway, so why not. Right? Click on the photo below to go to Helene's blog and find others who are linking up too! At first, I didn't think 2017 had much going on, and for so many people 2017 was a terrible terrible year with politics, hurricanes, Nazis... just to name a few things. But, when I thought about it, there were a few big moments at least for myself and my family! My sister and her husband had their first baby! All year my family and I were preparing, organizing the baby shower, and general excitement for the new arrival! She was born in November and we couldn't be happier! I got a new job at another hotel. The same position at the front desk and same company as the hotel where I was previously, but this one is much closer to home. At my old job, I was driving an hour each way and when I looked at the cost of the commute, it just wasn't worth it. I'm really enjoying my new hotel which is also smaller than the previous one, and makes for a much more relaxing work environment. My parents and I moved to a new condo. It's smaller than our old place, but we really like it! It's cozy and perfect for us and the animals. I was in a friends wedding in Orlando, and while I was there I decided to spend a couple extra days to visit Disney World and Universal Studios. It was a blast! The best part was meeting Snow White (along with Elsa, Anna, Aurora, Mickey Mouse, Mary Poppins, Alice, Ariel...). Which, I know that makes a total dork! But I love Disney, and Snow White has been my favorite character ever since I was a toddler. I've gone to Disney World a few times, but never got to meet her before now, so it was definitely exciting for me. Me at the wedding in July. The venue had an awesome library! I finally bit the bullet and got my new blog started up! My old blog, Love Woke Me Up This Morning, had it's domain expire and I couldn't get it back up again. I took it as a sign to officially close that one down and get this one set up. I'm loving Square Space, and I'm really proud of the design and layout, and my blog posts and topics are much more intentional than they used to be. Meeting Snow White in Epcot! I read 113 books in 2017! In 2016 I had read 124, and I wanted to read less so I had more life/reading balance. Technically, I did read less. So... mission accomplished? Although, I'm not sure if I've nailed the life/reading balance yet - haha. I'll be posting about my top 17 books of 2017 next week, and if you want to see a full list and more stats, click here. One of the pretty trees at our new condo! 2017 was the year I finally began querying my urban fantasy novel to literary agents! It was terrifying. After sending out 47 queries, I had exactly one agent request more pages, and all 47 ultimately said no. Sometimes through an email back, sometimes by not responding at all. Which, was a bummer. But, this was a big and important step for me in my writing career. Sending out queries helped me learn how to handle rejection. I learned what agents are looking for in a good query and opening pages. I learned how to get over the fear of putting myself and my work out there. Now that I've overcome the hurdle of starting the querying process, I know I can continue to do it. I got started on a new project, which I've nicknamed "Vampire Snow White." It's exactly as it sounds. What if Snow White was a vampire? I'm obsessed with this project and these characters. It's been so much fun! I joined the summer writing contest through The Write Practice, which was my first venture into short fiction and writing contests. I learned that I'm not very good at short fiction, but it's something I want to continue to work on. Thus, I created Flash Fiction Fridays here on my blog. It's a series I'm already loving, even though there's only been four stories so far. I hope you all have been loving them too! Finally, I gained more writer friends and critique partners. There's a trio of myself and two friends from college where we've made our own little writing group and it's been a blast reading their pages and getting their feedback on mine too. Even beyond the writing elements, I'm living for our ongoing Facebook chat. Me and my niece, Elsie, the day after she was born! Isn't she the cutest? I know that in all reality, the start of a new year is just another day. We don't need to count down to midnight and turn the page in our calendar to get started on our goals and what we want to accomplish. But, I love the symbolism behind it, and I like having that set time to start fresh. It doesn't erase or change anything from the year before, but it has the feeling of something fresh and new. Here are a few of the things I'd like to happen in 2018. It sounds a little sad, but I had a hard time thinking of goals for myself that are simply for myself and not the blog, reading, or writing. I'm not one to say "This year I'll go to the gym every day!" or "I'm going to eat healthier!" We all know that neither of these things will ever happen. But, I did think of a couple things in life I know I need to work on. Spend time with friends. Now that I have a semi-normal work schedule, I don't have an excuse to not see them anymore. I get off work around 3pm nearly every day, which means I have plenty of time in the afternoons to hang out and have a social life. I'm always happier when I'm out and about, but I let some anxiety get in the way. Make a plan to go on a vacation. I've been doing better about this the last couple of years. I love to travel and see new places and experience new things, but I have a hard time making it a reality. My mom and I were discussing this not long ago and how we need to pick a place to go that we've always wanted to see, and figure out how we'll get there. I'm pretty proud of myself as it is with being able to keep up with blogging as much as I have been already. But there is always room for improvement and growth! Build up my email list. From what I've read for aspiring authors, I always hear how the email list is super important. Already I have it set up so people receive an email with each blog post, and a monthly newsletter. I'd love to have a freebie to include though when people sign up like an exclusive short story you can only get as an email subscriber. Keep an eye out! Post more often. So far, I've been posting once a week. Twice when I have a Flash Fiction Friday or a special occasion. I'd love it though if I could bump it up to twice a week. Blog posts about planning for the new year means showing off your new planner, right? Right. Usually, I try to go easy on the reading goals. Reading is a fun escape for me, and I hate it when I feel as though I "have" to read a certain book, vs. wanting to read it. But, I did notice that I wasn't reading as intentionally this past year, and there are a few things I'd like to accomplish. Read less. It sounds weird, and this was a goal last year (I read 124 in 2016 and 113 in 2017), and it's one I want to keep up. I love reading a ton of books every year. But, I know I need to be better at life/reading balance. I don't want to wake up one morning realizing I missed a ton of life opportunities and experiences because I had my nose stuck in a book. Read more own voices. I definitely have been reading own voices books, and reading books where the main characters are from marginalized groups. But, when I look at the numbers, I can do way better. Especially with own voices and books for adults. Not that I don't want to read YA own voices - I absolutely do! But, I'm familiar with that market and know where to find them. I want to work on finding authors for adults who are also own voices. All books need to be diverse and have representation from everyone in them. But, we need to be sure the own voices are being raised up. Read books I already own. This is a big one. Of the physical books I already, I have roughly 35 I haven't read. Which isn't a bad number. But of my ebooks... that's a whole other story. I have a severe ebook downloading problem. They come so inexpensive, I feel like a fool NOT downloading them! Then here I am... with over 130 unread books sitting on my Kindle app. When I think about it too much, I get ridiculously overwhelmed. My writing goals at this point in my life are some of my most important. Mainly because I'm impatient and I just want to have an agent and a book deal RIGHT NOW. I know this is not realistic, and even after an author signs with an agent, there's a ton more waiting and work to be done. But, my impatience helps to keep me motivated. Have a full rough draft done for Vampire Snow White and ready to send to my critique partners by the end of February. I got a big chunk of it done during NaNoWriMo, took a much needed break in December, and now I'm ready to get back to it. This means writing about another 50,000 words. Considering I wrote 50k in one month, I can totally get another 50k done in two. Work on revisions and rewrites for my urban fantasy, Guardians of the City. This one is much more tentative, because I do think I need to take a step back from it for a bit. But, I'd like to think at some point this year, I'll be ready to tackle it again. Get back to work on fairy-tale mash-up. This is a project I was in the very beginning stages of before VSW took over my life. I didn't intend to cast it to the side, because I think it has a lot of potential. But, I'm so excited for VSW that I knew I needed to put all of my focus on that. I think while I'm waiting for readers to send me feedback on VSW I'll play around with this one a bit. Get some brainstorming and outlining done. I'd love it to be my 2018 NaNoWriMo project! Apparently, I need to use pencil when I use my planner because I'm always crossing things out and rewriting it! How's that for a list of goals and resolutions for 2018? I feel like such an overachiever when I look over these lists. But, I also know in reality, I most likely won't be able to accomplish all of them, and I'm okay with that. Which doesn't make me such an overachiever after all. How was 2017 for you? Any favorite memories for the year? Do you have any New Years Resolutions, Goals, or Plans? Like what you read? Consider buying me a coffee. This simply helps me to continue creating content and I really appreciate your support!